Five paddlers enjoyed an outing on Quathiaski Cove on May 26. It was mostly sunny with a light southeast breeze. The day came with very big tides and currents, which made for interesting paddling even in the relatively sheltered waters of the Cove. We explored the Cove and enjoyed the pony on Grouse Island, sea urchins, Harlequin ducks, and baby jellyfish. Eight hikers took advantage of the Kellerhal’s generous offer to hike on their 160 acre property. The route followed mossy bluffs over Raven Crag and out toward Hyacinthe Point with great views of Hyacinthe Bay, Sutil Channel, and Chinese Mountains. The lunch stop at Coast Mountain lookout added views to the east. We also walked to the pond, the beach and the old Schoolhouse. Rolf and Heather provided excellent commentary about the history and natural history of the area. Contact Info 250-203-3530 or willlavigne@hotmail.com Please contact the trip coordinator before 9 July if you are interested in this trip. Description Drive to Port Alberni. Park and get a ride to boat then one hour boat ride to trailhead. Hike to falls is 16 km which is a 300 metre gentle uphill climb. Intermediate hike which can take 7 hours.There will be a 2 hr hike from base of falls to Love Lake for the best view of Della Falls.Third day afternoon boat ride back then home.Overall plan- 1st day get part way or if all goes well be at Falls, 2nd day get to Falls and trip to Love Lake for view, 3rd day early am start back. Also this could be done in 4 days but that needs to be determined prior to leaving Quadra. I would prefer to do it in three days. Costs Ferry plus, $10 to park car on boat owners property or park free where boat is, $125.00 per person for roundtrip. Trip limits 3-4 people; 5 at the most. Notes: Issues or concerns: no bear cache — need to bring rope; there can be bears. Mice like the tips of camelbacks and try to get in tents. Cable car crossing. There can be wasp nests on the trail and that’s not good for the 2nd or 3rd person.I have tentatively setup the boat ride and will get feedback from someone who is planning on going the week before. There is info on the web and it is accurate according to a source. If there is interest please contact Will ASAP, to figure out timelines for boat and hiking details. Contact Info 285-2393. Please contact the trip coordinators well in advance of the trip. Description We haven’t done these trips, but come to Cortes and explore with us. There are a number of options: 1) come Saturday on the 9:05 ferry, paddle with us, and return to Quadra on the 5:50 ferry, or 2) come Friday anytime or Saturday on the 9:05 and camp on Cortes, paddling together on Saturday and Sunday.The Saturday paddle is expected to be from near the ferry dock at Whaletown south to Shark Spit on Marina Island or to Coulter and Carrington Bays, conditions permitting. For Sunday, we could choose a paddle in Squirrel Cove, or from Manson’s Landing, or from Cortes Bay out and around Twin Islands, depending on conditions. Costs The cost of the ferry. If you stay over Saturday night, there is the cost of camping or other accommodation. We think we can launch the kayaks for free, but there might be a charge at Squirrel Cove or elsewhere. Notes: This is the weekend of the Cortes Music Festival, so definitely plan ahead if you want to stay over Saturday night. The Music Festival takes place right next to the Gorge Harbour Marina. If you want to party all Saturday night, Gorge will be the place to camp. If you prefer it quiet, Smelt Bay Provincial Park or Squirrel Cove will suit you better.Arrangements have not been made for the group, since we have no information about how many are interested. Camping at Gorge Harbour includes access to their pool and other facilities. Reservations can be made for Gorge Harbour by calling 935-6433. Tents are $25/day. Reservations for Smelt Bay are made on-line through Discover Camping. They allow up to three tents and four adults per site. The cost of a site is $16/day plus a $6 reservation fee. Tenting at Squirrel Cove is $15/tent. Phone 935-6327. Please contact the trip coordinator well in advance of this trip. Description The hike from parking lot to summit is 16 km, the distance from parking lot to Circlet Lake is 3-4 hr of easy to moderate hiking. Set up camp at Circlet Lake and on second day go to summit which is 3-4 hrs one way. The third day is time to head back. Costs Ferry plus $10/person a night to tent on platforms. Notes: This will be a very busy weekend up there so the earlier the better to get a campsite. 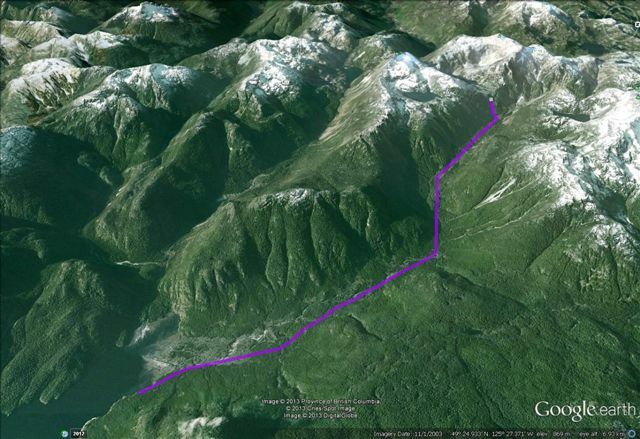 If there is no space at Circlet Lake then we have to go back 2.2 k to Kwai Lake. Bring water filter as you can swim in the lake. Fishing is allowed. Plan on bringing water for summit round trip as there is greater chance of no water at summit. Bring poles for the summit descent if you use them. There are toilet pits, bear cache/wire. No fires.Please google or check trail books about this hike.